Q. How do I send my app database to LightArrow for troubleshooting? You are here: Home / LifeTopix / Common Questions / Q. How do I send my app database to LightArrow for troubleshooting? 1.) Connect your iPhone or iPad to iTunes. You will not have to sync your device for this. 2.) On iTunes click on your device. You will see the contents of your device. 3.) At the top of the screen click on Apps. 4.) 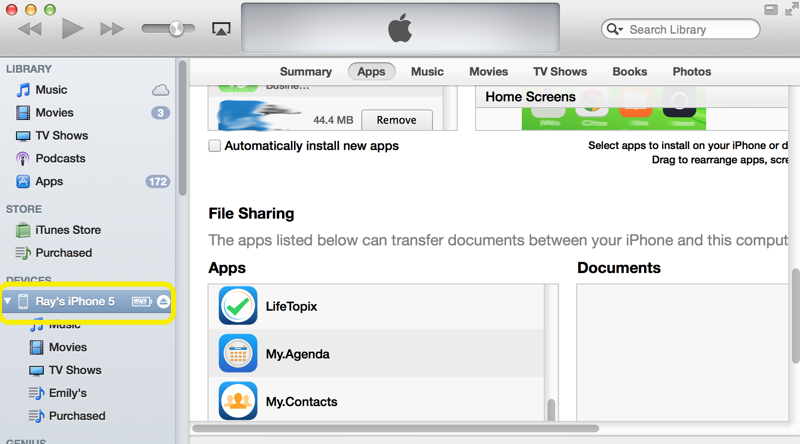 From this view scroll down to the “File Sharing” section. 5.) Click on our app form the list of apps. 6.) On the right side panel you will find the a file name “LightArrow.sqlite”. 7.) Drag and drop this file to your desktop.